A very old and dear friend passed away recently, so we attended the celebration of her life this last weekend. 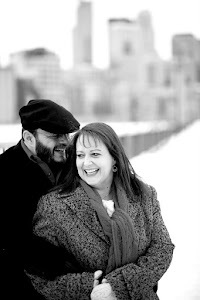 Carol and I worked together many years ago in a department store, and shared a love of sweet treats. So, it seems fitting that her family had some amazing food at their house, as part of the tribute to her. 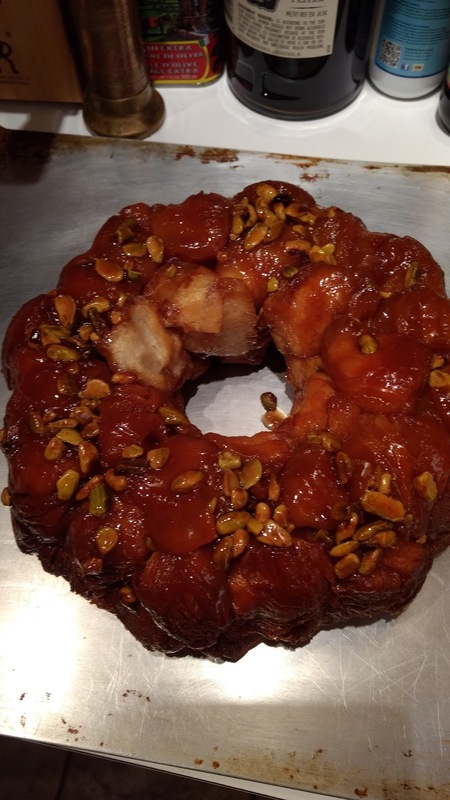 The original recipe, from Gwen Norberg (Carol's mom), recommends doubling the filling part of the recipe, so your guests and cookie aficionados can add as much filling as they like. I would agree ! I found the most efficient way to create these was to start the filling, then let it cool while you bake the cookies. In a small saucepan. combine flour and sugar, gradually whisk in milk, then beaten egg yolks, mixing well. Cook over low head, stirring constantly, until the mixture starts to boil and become thick. Remove from heat and let cool. Once mixture is completely cool, cream together butter and remaining 1/4 cup of sugar, and add to the cooked mixture. Preheat oven to 350 degrees, and line cookie sheets with parchment paper. 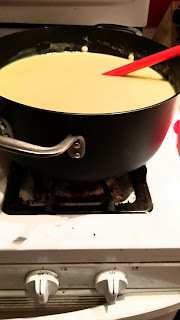 I microwaved the butter in my mixing bowl to streamline the process. Then, stir in the remaining ingredients. Drop by teaspoon full onto parchment paper, making sure to leave plenty of room in between, as they spread out quite a bit. Bake 10-12 minutes until lightly brown around the edges. 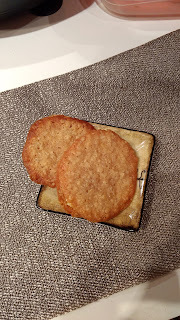 Remove from oven, and let sit on cookie sheet for an additional 5 minutes before moving to a cooling rack. Once the cookies are cool, spread the filling between two cookies to make a "sandwich". This is best done right before eating, so the cookies maintain their crispy texture. I had never experienced anything like this before I moved to Denver many years ago. 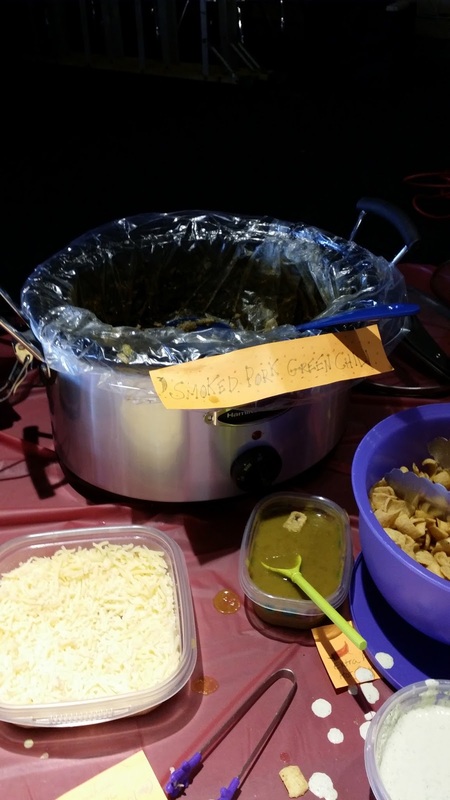 There aren't may restaurants that don't have some version of this on their menu, and certainly no self-respecting taco shop would be without their own"special recipe" for green chili. My version incorporates many of our homemade sauces and canned goods, so I will offer alternates to those, unless you want to start canning ! The real key for this version was roasted hatch chiles. We grew some on our garden, but I was also able to locate some at a local grocery store for the first time this year. They are seasonal, so I roasted as many as I could get my greedy hands on, and froze them for use later. They peel very easily after being frozen, which is a bonus when you are using this many in a dish. I wish I had taken the picture sooner...this is the aftermath of a chili cook-off I entered with this recipe. I won for the "Most Spicy" !! So, what do you do when you "over-purchase" hot peppers at the Farmer's Market ? 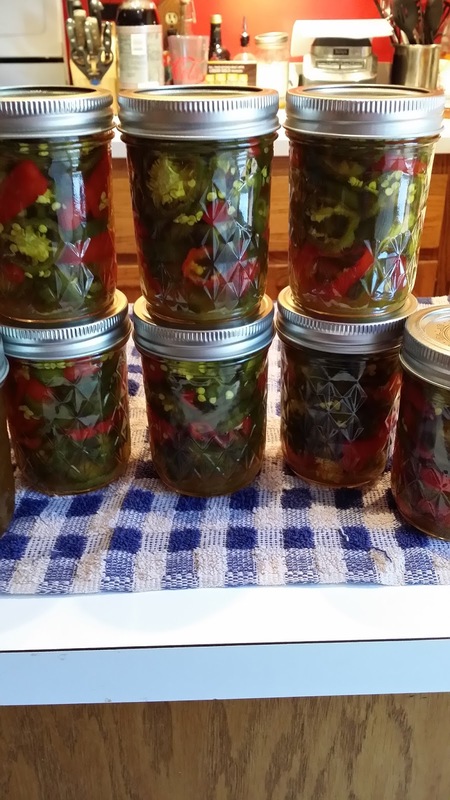 You make candied jalapenos ! I honestly have never tried these; however, I am now a huge fan. I have always loved the combination of sweet and spicy, but this takes it to a new level. The side bonus is 3 small jars of the sweet syrup, infused with peppers, which will make an amazing glaze for some Cornish game hens I have in the freezer ! These are so easy, and are great with cheese and crackers, or incorporated into a sandwich, salad or snack ! In a large stock pot, mix together vinegar, sugar and spices. Bring to a boil, then simmer on low for 10 minutes. Stir in sliced peppers, and cook for 5 minutes. In the meantime, start your canner with boiling water, and reserve 10 half pint jars. Bring water to a boil, and boil jars for 10 minutes. 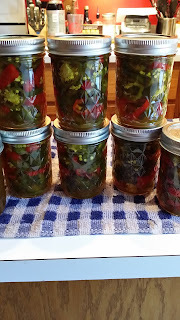 Using a slotted spoon, place peppers in sterilized jars. Bring remaining syrup to a boil, and boil for 5 minutes. Pour hot syrup over peppers up to 1/4 inch from the top of the jars. Process in a water bath canner for 10 minutes, then cool and store. Any extra "syrup" can be canned along side the peppers, and used for glaze for meats. I really love this soup. It's fairly simple to make, is vegetarian, and dairy free, so easy to share with people and not worry about dietary issues. The first time I had potato leek soups was many years ago in Ireland. Before that, potato soup for me was chunky, creamy, with bacon, maybe carrots. So, when we were served this at a dinner, I was blown away ! 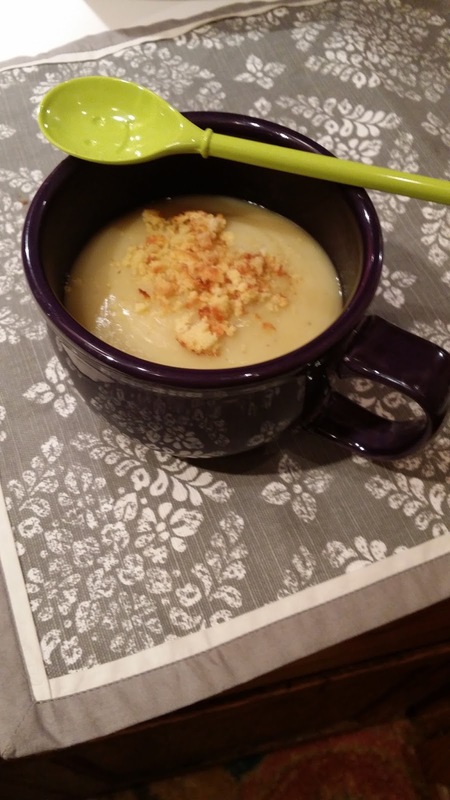 It still tastes creamy, warm and comforting, but was different than anything I had ever had. This recipe makes a large batch, but freezes well, so save some for later, or share the love ! In a large Dutch oven, heat the olive oil over medium heat. Add leeks and garlic and saute until soft. 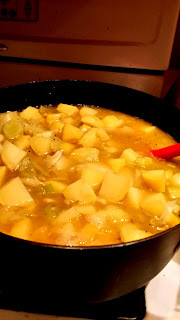 Pour in vegetable stock, then slowly add potatoes, to prevent splashing. Bring to a boil, then simmer over low heat until potatoes are soft enough to be blended. Using a blender or immersion mixer, puree the soup until smooth. Stir in spices, then let simmer for 10-15 minutes, tasting for seasoning. 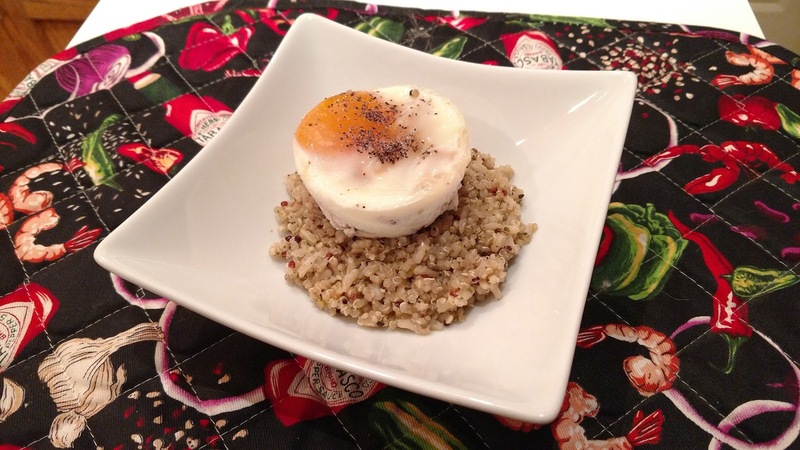 Serve hot with bread or toasted bread crumbs on top, for texture. It was quite awhile ago that I made a recipe for a sauce that called for garlic confit. So long ago, in fact, that I can't recall the original recipe. The garlic confit, however, I most definitely remember. My husband is a big garlic fan, he will even eat the cloves raw sometimes. I like it roasted, or chopped finely and used in recipes. This confit garlic is almost like candy. You can eat it alone, or in recipes, but it also has this amazing by-product. You get a nice batch of garlic infused olive oil, which I have used for grilling vegetables or even to start an omelet, in place of butter. And it's super simple to make. I can almost guarantee, if you like garlic, you will wind up doubling or tripling this batch ! In a medium sauce pan, combine olive oil and garlic. Simmer over low heat, being careful not to boil, until the garlic is soft and golden brown. Remove garlic from oil and let both cool. Store garlic in the refrigerator, and oil is fine in a bottle on the counter.